This entry was posted in In a Vase on Monday and tagged cat wine bottle, Cut flowers, flowers in a vase, fringe plant, garden flowers, Hydrangea, in a vase on monday, Rambling in the Garden, Words and Herbs. Bookmark the permalink. Hi Cathy! I had fun today, both with the rain and reading your blogs for inspiration. I’ll have to go find the link to the blog with the fringe plant. They probably commented on your post. I know I should be looking at the vase of flowers which are very nice but is that a mural on your back wall behind the sofa – I am intrigued! I love that mural, and the artist, Donna Pierre. She’s also the artist that redesigned our Little Free Library. Let me find the link. I was admiring that, too. I would gladly send you some of our rain! How nice it would be if we could all share the weather we have in excess with those in need. It’s miserably cold in Canada and the eastern seaboard of the US. Here it’s been dry and unseasonably warm, even for California. Are you getting torrents of rain? Oh you must be so thrilled to have your rain after an even fdrier winter than usual. It certainly makes for a fresh looking vase – and thos ehydrangea have retained such a pretty colour. 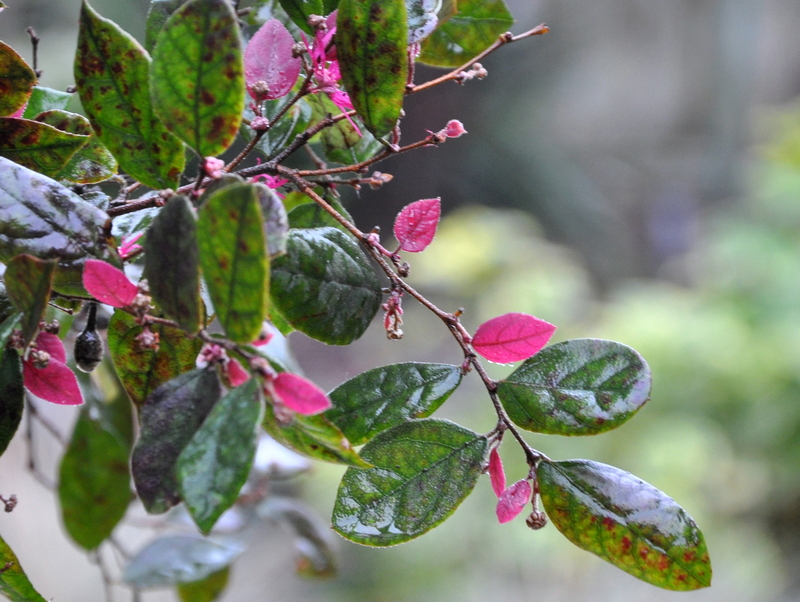 I didn’t know that loropetalum could have variegated leaves like this, making it an even prettier plant. I am glad you felt you could pour the wine away – the cat vase was certainly too good to waste and it would have been a shame to have waited any longer to use it! Thanks for joining us today, and pehaps we will see you again soon, whatever the weather! Hi Cathy! You’ve created such a fun meme. I’m going to try and join in more often this year. I too am surprised to see those variegated leaves. I’m wondering if they’ve changed now that the plant has matured (it’s about 12 years old). There is always so much to learn about plants and gardening. I am so happy you have rain. We are getting a little but not like we need either. Lots of frost and deep freezes so nothing is blooming outside. Your vase full of color is sign of things to come for us up here. Me, I have often bought wine for the bottle. I’m not picky about wine as long as it has good flavor. I’m more fussy about the little bit of beer I drink. Cannot touch an American beer even if I was dying in the desert. Yuck. They don’t usually come in pretty bottles though. Marlene, a deep freeze doesn’t sound like any fun. Brrr. I hope you have lots of cozy projects to keep you engaged indoors. Mike likes craft beers and even took a class many, many years ago to learn how to make beer. He’s with you on the American beer “flavor”. I love gingerade Kombucha, but not beer, even thought they are apparently similar. Funny that. I hope you get some rain. Good Morning, Alys. Of course I have plenty to keep me busy indoors. Just need to get to them. And it’s pouring out there! Finally got Christmas all packed away. I’ve had Kombucha before but not gingerade. I rarely drink beer or wine unless it’s an occasion so when I do, I want good taste. Never ambitious enough to craft my own though. 🙂 Go Mike. Off to sewing group this morning, in the rain. 😉 Have a wonderfilled week. Hugs and love,. What did you work on in sewing group? Our rain stopped for now. It will apparently be back a week from Thursday. Sadly, the mudslides in SoCal were deadly. It makes me feel bad for celebrating the rain. 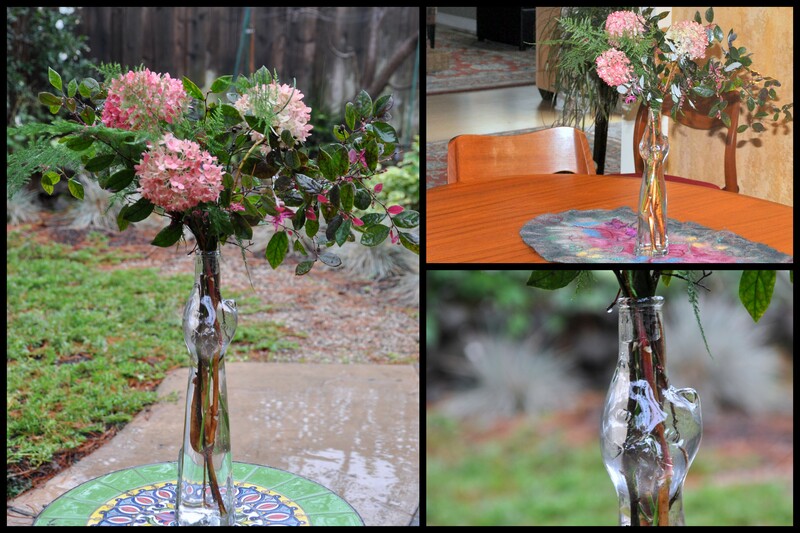 Happy you got your rain – and love the vase, the flowers and the runner. Oh, hoooorayyyyy! What a huge relief it is to hear that the long dry spell has finally ended, Alys … you can almost hear the plants breathing a big sigh of gratitude and relief, can’t you? And how clever of you to “repurpose” that adorable wine bottle by disposing of its unpalatable pink contents! I would have done the same. 🙂 Well, enjoy those negative ions and I’ll keep my fingers crossed you will have a more moderate spring and summer. Hello, Heidebee! The rain started in the middle of the night and has continued steadily throughout the day. Tessa is quite annoyed. She’s gone in and out the back door at least twenty times. We adopted her at the end of May, so the whole concept of rain is new to her. It makes me smile watching her puzzle it out. It does seem that the plants are breathing a sigh of gratitude. I certainly am. Thank you for your well wishes for the season ahead. How magical it must have been to awaken to the sound of rain! Poor Tessa, though … isn’t it sad to see a pet so confounded by an unfamiliar new world, and to not be able to explain it to them? It is, and yet I catch myself saying things like “well, what do you think of that, Tessa?” and “I guess we’ll have to stay inside today.” [snort] I’m a goofball. The hardest part is taking them to the vet. If a genie could grant me three wishes, the first would be a way to communicate with animals. I’m glad you got some rain, and I like the way you explained a little about each plant you included in your lovely arrangement, for those of us who are not experienced gardeners! Thank you! It’s such a lovely, gentle rain, too. I’m glad you enjoyed the flower descriptions. I’m getting better about linking to them, too. I hope your new year is off to a good start. Oh my gosh, I was going to comment on the mural too. It’s fabulous and looks like a WPA mural. As for your flower arrangement, it too is lovely and I am a fan of pinks. So glad it’s raining out there now! It bodes well for the future pumpkins…If you don’t know Eliza Waters, you should go to her blog–she’s another participant of In a Vase on Monday and can be found here: https://elizawaters.com for wreath making, flower arranging and a fabulous flower garden. It looks as though all is well in the world of Alys! Hurrah! Hi Lisa! Thank you for your good cheer. I really had fun putting this vase together. I’ll go check out Eliza Water’s post as well. Thanks for the link. There is a lot of interest in the mural, so I’ll write more about it soon. Donna is an amazing talent. I’m lucky to know her. Oh my, her site is gorgeous! Thanks for sending me Eliza’s way, Lisa. Glad to make the introduction! Welcome to the cadre of IAVOM contributors! I’m joining in your rain celebration as the storm has at last made its way to Los Angeles County too. Our seasonal total is now up to 0.42/inch but the forecasters say we’re due for more and I’m counting on it. Hi Kris, Thanks for stopping by. I’ll pop over to see your post after I comment here. Sadly, the rain caused devastating mudslides near Santa Barbara. What a terrible shock. 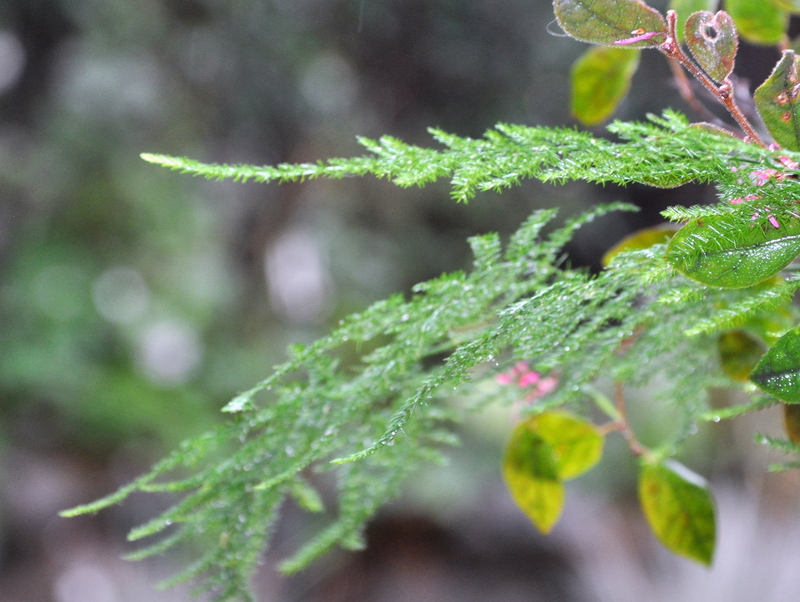 The fire season went impossibly late, and then the rains came before the land could recover. I hardly know what to say. I hope you are out of harm’s way. Loving the gentle drenching – even if the garden is under water. Hurray for rain! Your under water again? Oh dear. And the mudslides in LA definitely put a damper on my enthusiasm. The land hasn’t had any time to recover. Nothing like last winter – and nothing like LA, thankfully. And very much needed! No complaints here. Last winter was one for the books. I can’t believe that I’m visiting WP (finally) on the day that you posted! 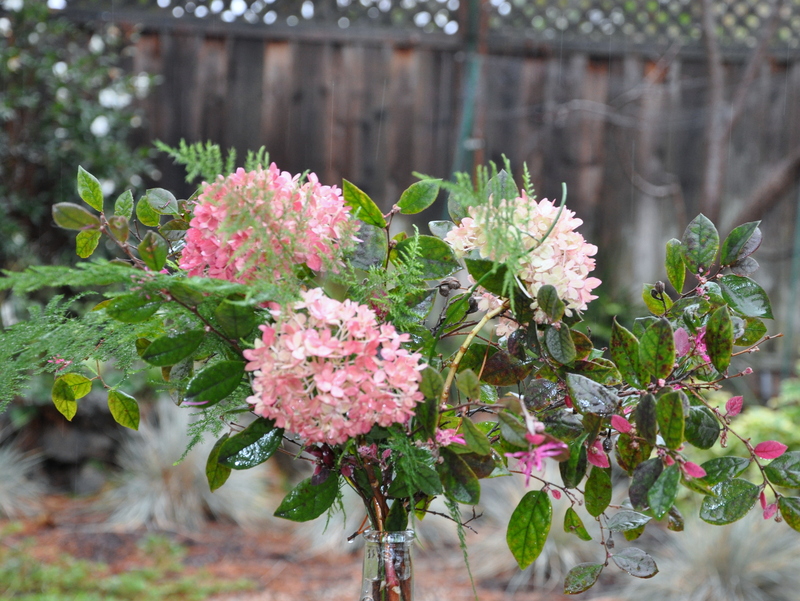 Your vase of flowers is beautiful and YAY for rain! I know you are thrilled! 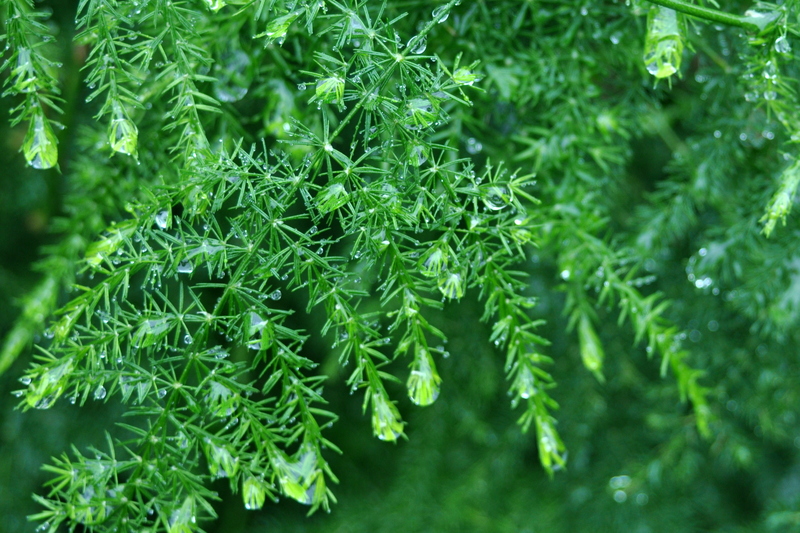 That first image, of the oh so wet greenery, is lovely! Kismet! I’m so happy to see you here, LB. I’m glad you laughed at the wine comments. Do you like rose? I enjoyed the rain, and the garden looks refreshed. Rain! How wonderful! I hope it is still raining as you are reading this ☔️☔️☔️ and that Tessa has worked out what rain is. It is a lovely vase of flowers, and doing this “challenge” is a lovely way to remember to have a new bouquet each Monday. My Mum always has a small sprig, usually geranium, in a small vase in the bathroom. By the way, I love the poem at the top of your post. It is perfect. Thank you, Anne. It rained all day and into the night. We had a trace of it this morning, but now the storm has passed and we’ll have to wait another week for the next one. I enjoyed it while it lasted. I love that you Mum always had a little something in a vase. This exercise has taught me that anything from the garden can go in a vase. I love geraniums. They remind me of my time touring Europe. I’m glad you liked the poem as well! How absolutely awesome is a refreshing rain? I sure wish I could feel it on my face too. I like how rain feels on a warm evening. I like how it sounds, plinking off everything around and I love how it smells. I think bumble bees like it too, they can often be seen buzzing about just after. Yes, yes, and yes: the way if feels on your face, the sound of the drops, the smell…all of it. The storm has already passed, but we’ll have another one in a week, if the weather predictors are right. LOL on not looking away at the wine comment. I’ve never seen you drink rose either, so I don’t think you would be too sad. Well, there wasn’t as much percipitation but the temperature took a big plunge. One of those, “could’ve been worse” situations. The mudslides have been described as looking like a war zone. They are absolutely horrific. 17 dead and 17 missing and homes, cars and property buried under mud. It’s been a devastating year for this state. I bought two! One is in the garage and the other in the center of the house, so to speak. Everyone knows where it is and how to use it. Thank you for your encouragement. I have a bit of survivors guilt. The floods and fires bookended the Bay Area. We did have floods in San Jose last February, but nothing like the mudslides in LA with lives lost overnight. It’s horrible. What a lovely idea to post a vase each Monday. Yours is fresh and charming, and I much prefer it to wine. Thank you for your kind words. I’m going to try to post a vase more often. There are quite a few that post. Perhaps you’ll join in, too? I don’t know anyone who loves rain like you do!! But I get it–you’ve been through a lot out there and the rain must seem like a blessing and a baptism. But now people have to worry about mudslides–that’s terrifying! 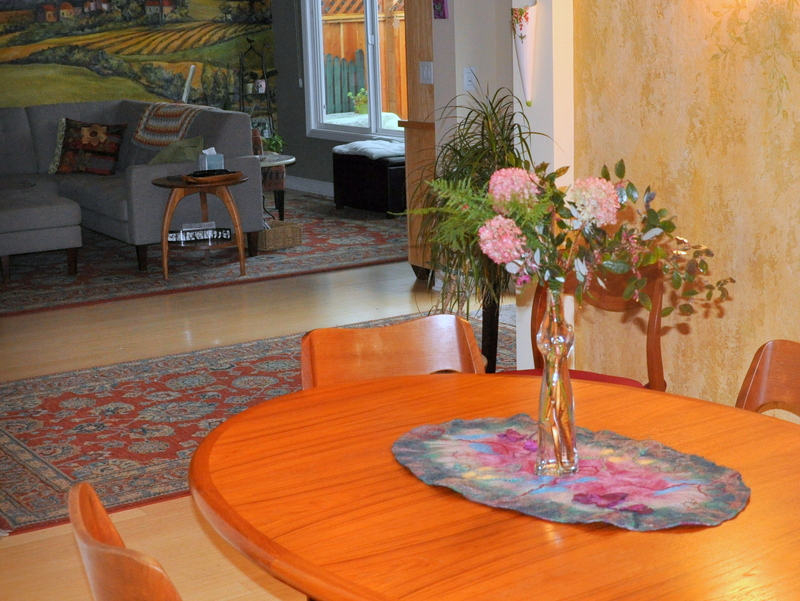 Your vase and your flowers have wonderful backstories and, yes, it would be fun if that fern could talk! Go enjoy the drizzle, Alys! Hi Kerry, When I wrote this the mudslides were only a possibility. I’m devastated at the damage and loss of life in Southern California. They issued mandatory evacuation orders, but only about 15% of people left. Now I’m reading that 17 people have died and another 17 remain missing. It happened so fast. The fires burned through the end of the year, once unheard of, so the land didn’t have a second of time to recover before the rains. I’m feeling a bit guilty for celebrating our rain, but of course we need it nonetheless. It’s heartbreaking. So pleased you had some rain….just as l was pleased to have a few hours of sunshine on Sunday. Is that vanille framed? 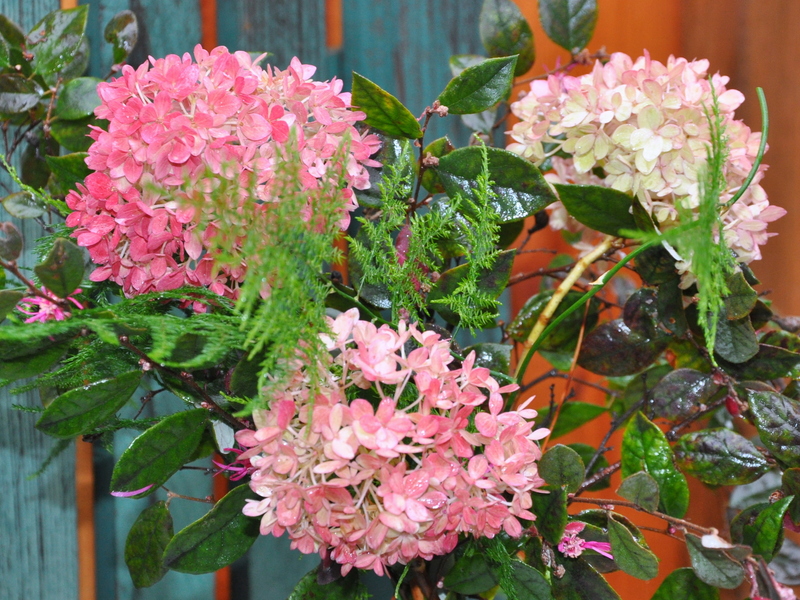 Your hydrangea is similar to mine…so we each may have two similar plants… welcome to IAVOM. Thanks for your warm welcome, Noelle. I’m glad you got some warm sunshine. I had to look up the term Vanilla Fraise. I see that it’s a type of hydrangea. What a stunning plant. I can’t recall the genus of our hydrangea, but though the color is similar to yours, our blooms are less conical and more round. Aren’t they gorgeous plants? I know that everyone else is usually sick of the rain, but we get so little and it has been a long time coming. 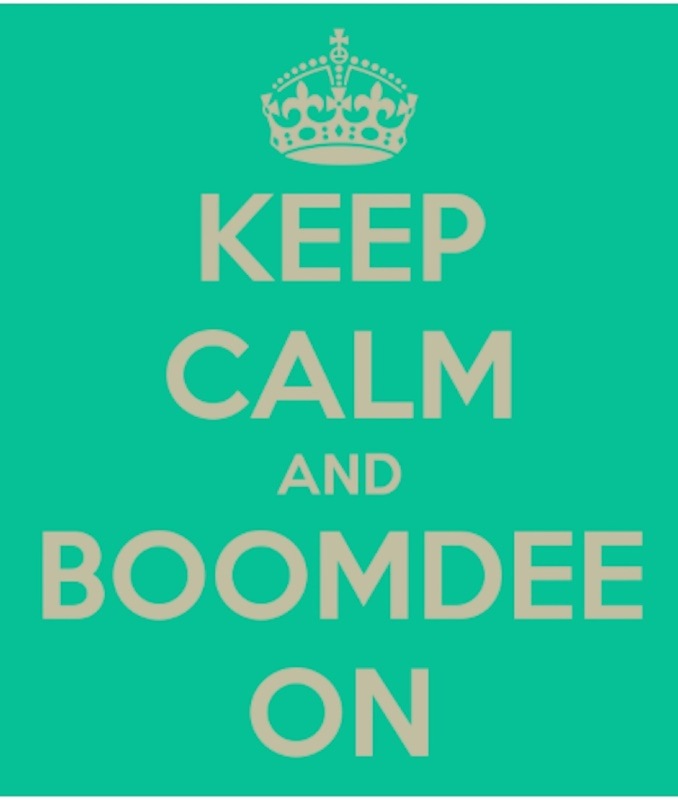 Sadly, it had the opposite affect in Southern California with deadly mudslides. I feel terrible for all concerned. I don’t think Rosé is hugely popular. I don’t drink a lot of wine, but when I do I prefer chardonnay or red. You’ve made a beautiful and elegant arrangement in an intriguing vase. You had to keep that bottle. I had various asparagus ferns as house plants many years ago and they certainly are lovely but. I had no garden but a house full of plants and a window box. I suppose the ferns died off but I quite fancy one in the garden now. Enjoy the rain, it sounds wonderful for you. Alison, I hope you’ll treat yourself to some ferns now that you have more space. I gardened indoors for years as an apartment dweller, venturing out onto the patio with potted this and that. It’s been nice have a small plot of land for planting these past 21 years. Well done, Sara! I love that song, and Julie Andrews gorgeous voice. Great blog, Alys. We have things in common: blogging, gardening and cats, but not organizing (I wish 😉 ). 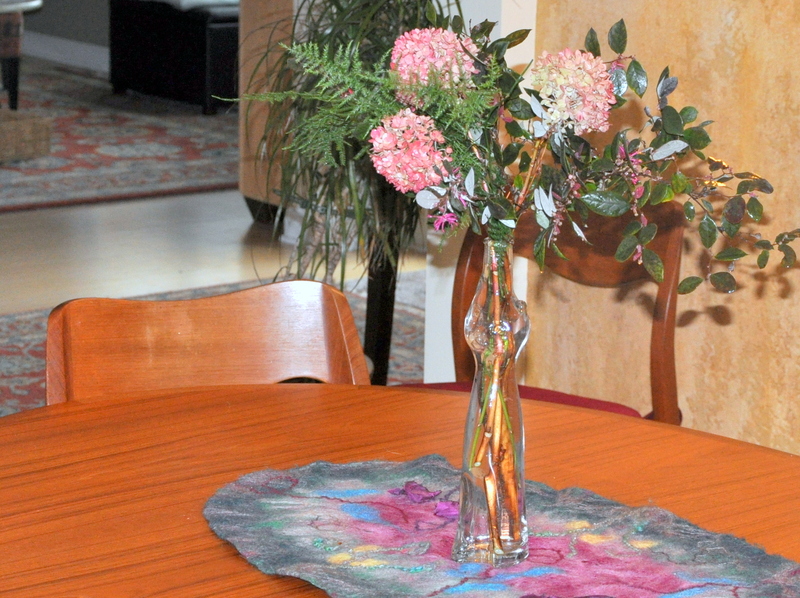 Your hydrangea and cat vase are lovely, as is your felted table runner. You’ve got me curious about the wall mural! Hello Eliza. I just started following you via BlogLovin. We do have a lot in common. And guess what: I just published a blog on the mural. So many of you were interested.